Market Orders are the most common type of orders in Forex. These are instant-execution orders - buying or selling a currency instantly at the best available price. For example: GBP/USD is trading at 1.1950/53. With a buy market order, you would buy pound at the ask price of $1.1953, and with a sell market order, you would sell euros at the bid price of $1.1950. Just like limit orders, stop orders also become market orders once certain conditions are fulfilled. You’d use stop orders to buy above the market, or sell below the market. 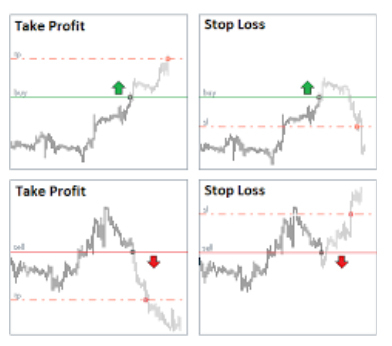 Stop loss orders are similar to take profit orders, with the difference that they are used to limit your loss. Once the market goes against you and hits the stop loss price, the position will be automatically closed to prevent further losses. Let’s say that in the previous example your analysis was wrong, and GBP/USD fell from $1.2500 to $1.2400. By using a stop loss at $1.2450, the position would be closed leaving you with a loss of 50 pips instead of 100 pips or more.